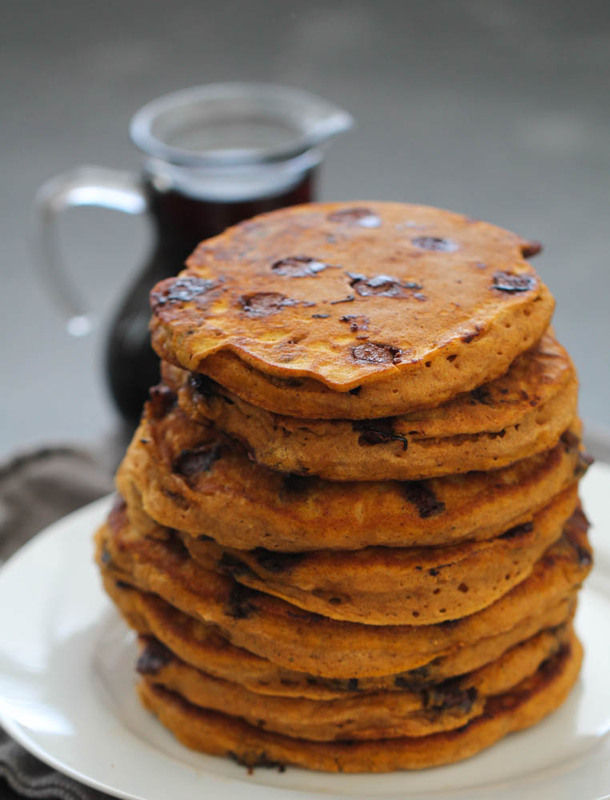 These Pumpkin Chocolate Chip Pancakes are light, fluffy and make the perfect fall breakfast! These are the best homemade pancakes because they are easy to make and the pumpkin and chocolate combination is absolutely perfect. There are few things I love more than a crisp fall morning! The only thing that can make a fall morning better is by having a hot breakfast. I absolutely love everything pumpkin, and when pumpkin and chocolate combine it is one of my favorite flavors. Growing up, it was very rare that we ever had cooked breakfast. My family loved cold cereal and in a house with 6 kids, I wouldn’t have wanted to make pancakes for that many people every day either! For whatever reason, I always assumed making homemade pancakes was difficult. I have made my fair share of pancakes using a mix now that I have a family of my own, but nothing compares to the taste of homemade pancakes made from scratch. 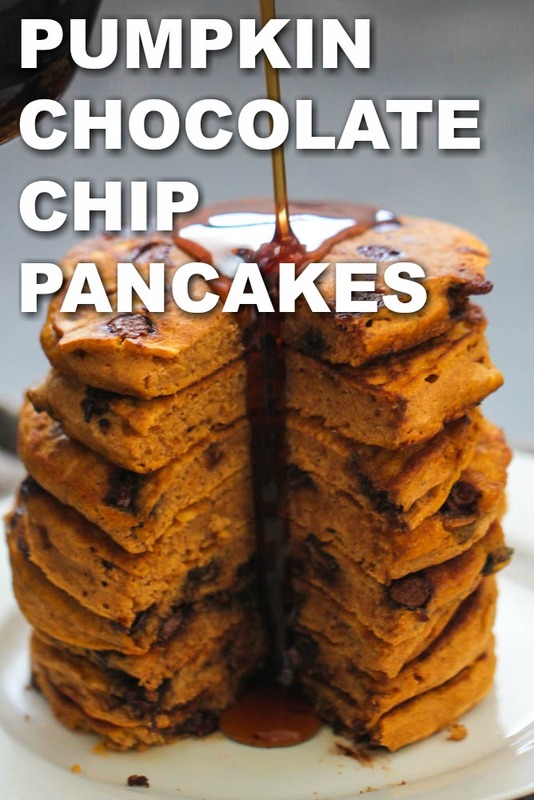 These Pumpkin Chocolate Chip Pancakes use my favorite homemade pancake recipe as a base and I’ve added some pure pumpkin pureé and some spices to give them a fun twist for fall. 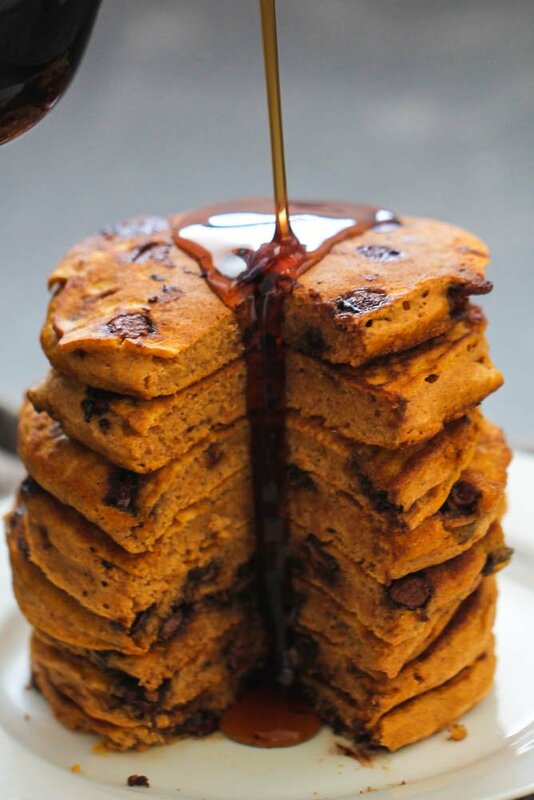 If fall had a taste, I’m pretty sure it would be these Pumpkin Chocolate Chip Pancakes! When it comes to any recipe using pumpkin, I am a little picky about what pumpkin I use! My mom always used Libby’s® 100% Pure Pumpkin and it has been a staple during the holiday season for as long as I can remember. 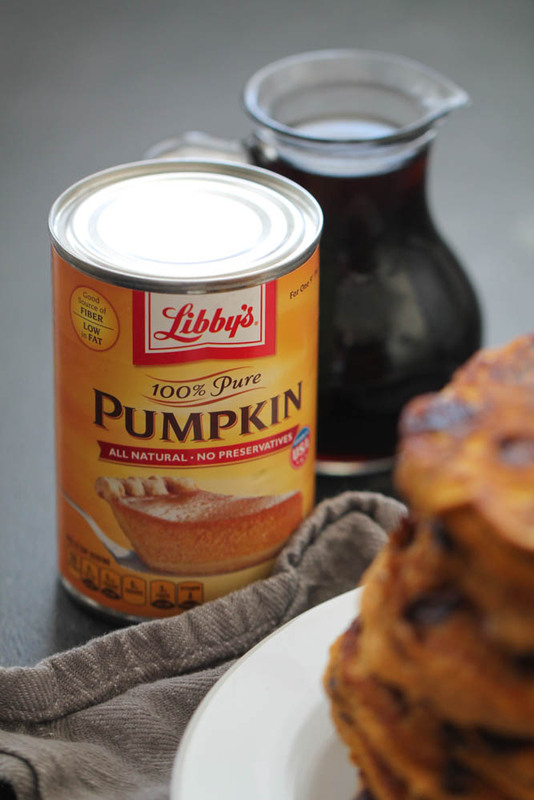 Libby’s® 100% Pure Pumpkin is all natural and is free of preservatives. It’s rich flavor makes the perfect base for all of your pumpkin recipes, whether sweet or savory. These Pumpkin Chocolate Chip Pancakes are pretty forgiving. If you want thicker pancakes, you can add less water than the recipe recommends. If you want to leave out the chocolate chips, you totally can! If you want a stronger flavor, you can add more of the spices to your pancake batter. After making these a few times, the recipe below is what I prefer but you can adapt the recipe to what works best for you. My kids love drizzling maple syrup on top of these homemade pumpkin pancakes, but they are delicious on their own too! Fluffy pumpkin pancakes filled with chocolate chips for the ultimate fall breakfast. Preheat griddle to 375 degrees F.
In a large mixing bowl, whisk together flour, baking powder, baking soda, salt, sugar, water, pumpkin, vanilla, cinnamon and nutmeg until well combined. Pour batter onto hot griddle (I used a 1/2 cup measuring cup for bigger pancakes) and cook for a few minutes on each side until golden brown and cooked through. Serve with maple syrup, if desired. These pancakes look incredible! Love pumpkin and chocolate together! These look so yummy! 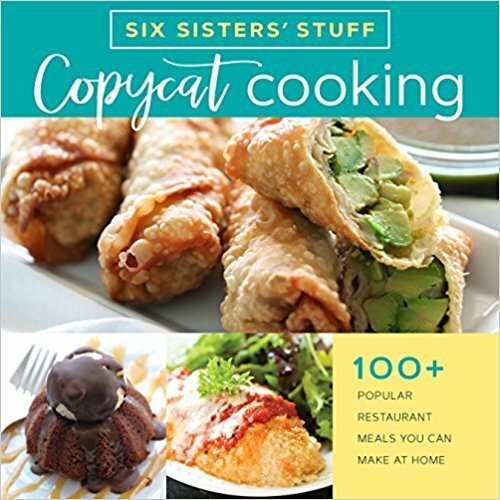 Will any pancake mix work or only the "just add water" kind? I am SO making these! Yum! Made these this weekend!! The best I've ever tried and egg-free!? This is my new go-to pancake recipe!! Chocolate and pumpkin really doesn't sound good but its actually pretty good.